SUBHEAD: It would be wise to start making contingency plans. Something ‘biblical’ is approaching. 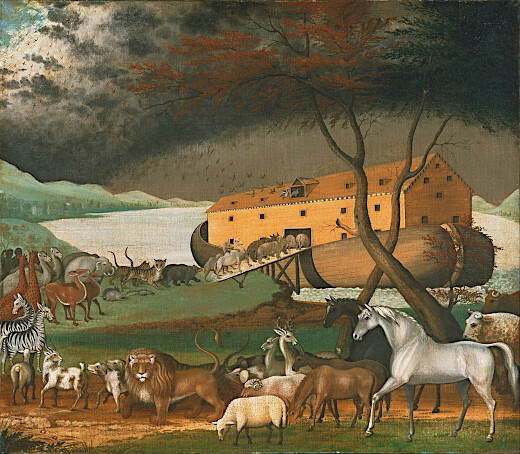 Image above: Painting of "Noah's Ark" (1846) by American painter Edward Hicks. From (https://en.wikipedia.org/wiki/Noah%27s_Ark). 2019 has started more calmly after a very volatile year-end in the markets. Focus has been on the trade deal between China and the US and the words of the central bankers, most notably those of Jay Powell. However, this is all just a distraction, a side-show. The market volatility was only the first sign of an approaching global economic crisis, as we warned in December 2017. Here, we present three scenarios that the global economy is likely to follow, when the global downturn morphs into something much more sinister. We’ll start with the most likely scenario: Global Depression. In a depression, everything that has been driven the economic expansion goes into reverse. Asset markets experience severe contraction (in excess of 50 percent), credit becomes restricted, corporations and households de-lever fiercely, and global trade flows stall (for more details see Q-review 2/2018). Gross Domestic Production (GDP) falls dramatically, between 10 to 25 percent. Unemployment skyrockets. The standard means of stimulus by central banks (CBs) and governments are exhausted without any notable improvement in the economic environment. The implosion of the current asset bubble will start a relentless unwinding of leverage and risk in the global financial system. Because major CBs are still “all-in” with rates pinned at or near historic lows, and balance sheets bloated to extreme levels, their ability to respond will be highly restricted. Governments are also highly-indebted, and when interest rates rise, some sovereigns are likely to default, aggravating the global banking crisis, which will probably be in motion already. Combined with the zombified global business sector and a hard landing in China, these factors will lead the world economy into a depression. However, a possibility of something even more ominous is lurking in the background. Systemic crisis would mean that the global financial melts down due to an existential deficit of trust between counterparties within the system. Before 2008, a systemic meltdown was mostly a theoretical construct. However, in mid-October in 2008, global leaders were faced with the possibility that banks would not open on Monday. The inter-bank markets had frozen, because no one knew the amount of the losses banks carried on their books. The global financial system was grinding to a halt. Politicians and central bankers saved the day by guaranteeing bank deposits and by providing capital and extraordinary guarantees to keep the important financial institutions standing and credit flowing. Now the problem is that many of these measures are already in play and when the next crisis hits, the solvency of governments and CBs will also be in question. This creates a perilous situation because, for example, the shares of the Global Systemically Important Banks have been falling since the beginning of last year, which was also the time when the balance sheet normalization (QT) program of the Fed kicked into full gear. This is no coincidence and it implies that troubles are, once again, brewing in the banking sector. Because a crash in the asset values would affect the collateral of banks and because global depression would lead to a massive increase in loan losses, the already-impaired banking sector could, again, face collapse. However, this time around, there is very little authorities can do to stem the panic. These factors make the systemic meltdown an ominously-likely scenario. Systemic meltdown would mean that all banking actions, distribution of money, loans, swaps, banking services, etc., through the banking sector would stop. Credit cards would cease to function, ATMs would not give out money and loans could not be originated or rolled-over. Following the likely collapse of global trade, the world economy would also collapse. This would imply that the global GDP would experience a harrowing fall of 20 to 40 percent. Modern societies would cease to exist in their current form. Could this all be averted somehow? We’ve been pondering this for two years now, and our resounding answer is no. The leverage in the system usually results in a crash at some point, and asset bubbles very rarely deflate in a controlled manner. However, CBs can probably still postpone the inevitable, if they could re-start Quantitative Easing (QE) programs or find some other way to push artificial central bank liquidity into the financial markets. To soften the eventual blow, and as an extremely desperate measure, central banks could, at least in theory, engage in a “QE-squared”. In it, major central banks would buy a hefty chunk of global risk assets, estimated to total $400 trillion. This would mean that the balance sheet of major Central Banks would need to expand at least five-fold from the current level of approximately $20 trillion. To cover the crippling losses to their collective balance sheets that these purchases would be likely to inflict, they would need to use their money-printing ability to paper them over. CBs earn seigniorage-revenue from all the money they create. This is the difference between the nominal value and the production costs of the money. Because production costs of digital entries are very close to zero, the seigniorage revenue CBs receive from each entry is close to 1-to-1. Still, this would mean that they would need to create new money in the range of tens of trillions of US dollars. By comparison, in 2017, the global nominal GDP of the world was approximately $75 trillion. To distribute such incomprehensible sums of new money, CBs would need to give it directly to consumers and governments. Even in normal circumstances, the production side of the economy would be unlikely to be able to respond to such a massive increase in (artificially created) demand, and this time there would have been wide-spread corporate bankruptcies driven by global depression. A hyper-inflation would be likely to follow. There’s also the alternative that CBs would make a complete U-turn and continue to backstop market losses. This would be the “way of Japan”, where the BoJ already owns over 40% of the sovereign bond universe. It would eventually mean the effective nationalization of capital markets which would continue to function in name only. We have no historical experience with what the expropriation of modern capital markets would cause. However, it would be unlikely to be anything good as capital markets have been around for several centuries, and they are extremely important in allocating financial capital efficiently. If CBs take a permanent active role in the capital markets, it would lead to financial market socialism. It would be likely to bring similar horrors as regular socialism in the form of lost incentives (breaking down of the risk-reward relationship) and inflated asset values. It is unlikely that global central bankers would be willing, or that they would be allowed, to do so. The global balance sheet of CBs turned in August 2018. This marks the start of global QT and thus the end of the most reckless monetary policy experiment in history. When this is combined with the slow-down in China, the engine of the world economy since 2008, we have finally entered the endgame of at the current business cycle. The desperate measures of central bankers and China enacted after the financial crisis have pushed the global debt and financial alchemy to never-seen heights. The global financial system has become rigged with leverage, moral hazard and regulatory failures to a point where a “purge” has become all-but-impossible to avoid. This is the end.